Anti-viral Foods, Essential Oils & Supplements to Prevent and Treat Flu. Most Potent Anti-viral Foods, Essential Oils & Supplements to Prevent and Treat Flu & Colds. 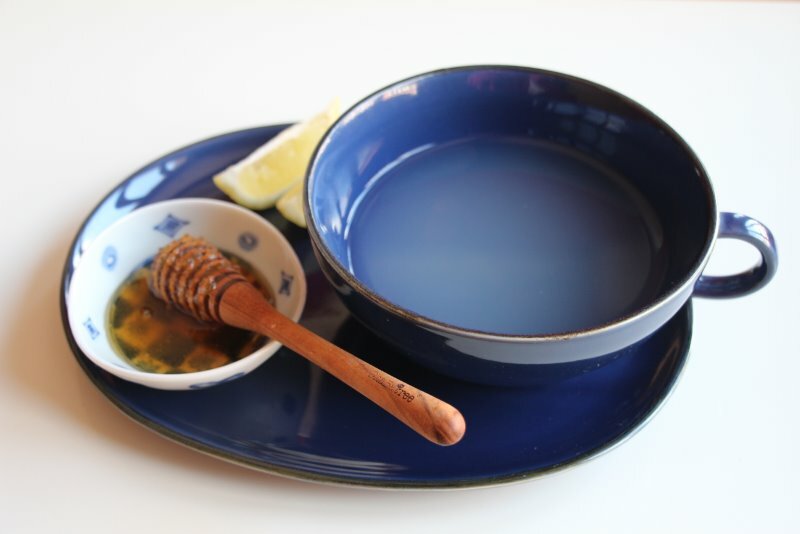 Natural Flu and Cold Remedies. The cold and flu season has commenced, and no matter whether Ebola pandemic becomes real or turns to be a hoax, it does not hurt to drive attention to some of the very potent anti-viral foods, herbs, spices and supplements that can help boost our immune system. While no one really knows whether the anti-viral herbs and plant medicines may work in case of an Ebola pandemics, I do believe that plant based medicines have better chances of working than a miraculous vaccine many are awaiting for. Most of the herbs and compounds mentioned below have in fact shown to be effective in cases of Influenza, Swine Flu, Bird Flu and SARS. People believe in what they want to believe. I believe in healthy food as the best preventative measure against the disease and plant-based medicines as the cures. Many of us don’t realize how lucky people living in the Western world are; I wish African Ebola victims and endangered people have access to at least some of the below mentioned foods and herbs! An excellent way to really strengthen your immune system over time is to expand our diet by eating some non-processed, high quality, real food. Naturally you should work on increasing the intake of food containing immune-boosting and anti-viral ingredients. Many dishes in Indian cuisine for example are packed with anti-viral ingredients. 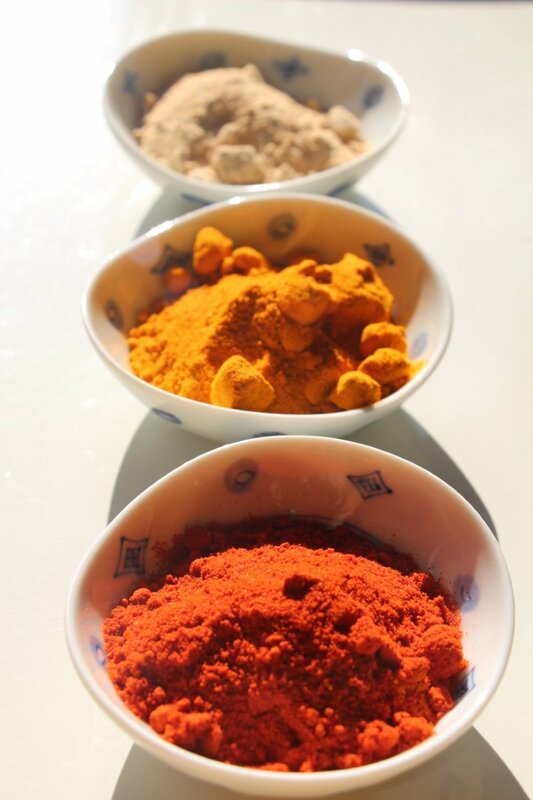 Think of curry – an amount of anti-viral ingredients that go in one portion of curry is amazing and non-comparable to many western dishes – garlic, onion, ginger, turmeric, cinnamon, black and white peppercorns, cloves, cinnamon, black and white cumin seeds, black, brown, and green cardamom pods! Vitamin D. Vitamin D is crucial, without it we are easily exposed to all sorts of diseases (read more). In months where there is not enough sun Vitamin D supplementation may be needed. Zinc. Zinc supports the immune function and protects respiratory function. The best way to go about making sure you are not deficient in zinc is by eating zinc and selenium rich foods like good quality fish and organic meat, spinach, pumpkin, nuts and seeds. 5. PROTECT YOURSELF IN VIRUS-FRIENDLY AREAS LIKE AIRPLANES, BUSES, TRAMS etc. Let’s discuss these strategies in more detail. You will notice certain repetitions: plants listed sometimes as food and as essential oil – that because some of the ingredients exhibit different properties depending if they are used fresh, dried, extracted in essential oils or concentrated or made into a tincture. E.g. drinking peppermint tea is probably sufficient to aid digestion but won’t do much to relieve the headache or the fever. On the other hand, rubbing peppermint essential oil on your skin may instantly relieve both the fever and the headache. That’s why using the same herbs in different forms is sometimes necessary especially when we want to create the different layers of protection. Creating aggregate protection against flu and other viruses cound and should be done in layers and using different mechanisms. For example, drinking some anti-viral teas may help a little, however drinking teas and juicing AND eating high quality food packed with anti-viral ingredients AND inhaling some anti-viral essential oils AND taking some immune-boosting supplements – well, that’s going to give far better results. Here are some of the top anti-viral foods that exhibit strong anti-viral properties and should be consumed in abundance. FRESH HERBS & SPICES. Some of these you can grow even in your window garden and incorporate fresh as part of your dishes, otherwise if you don’t have access to fresh plants you can use them as spices. All of them exhibit strong anti-bacterial and anti-viral properties. GINGER. 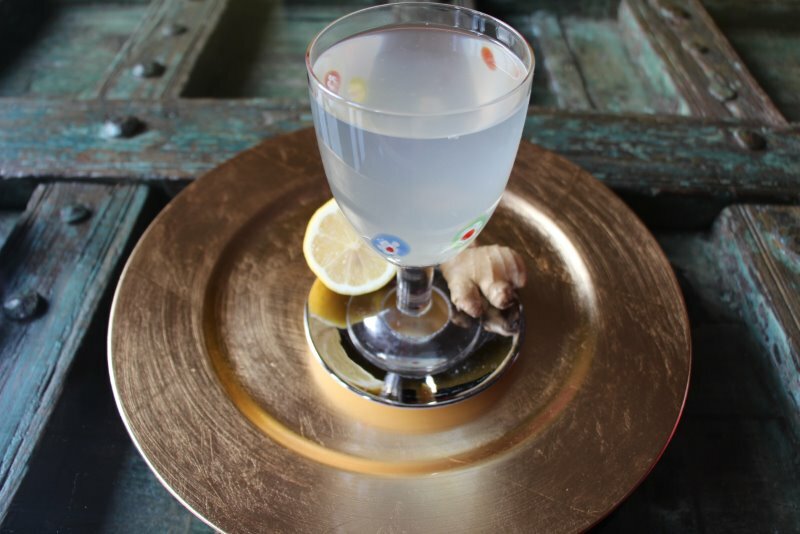 Ginger is potent anti-viral and anti-bacterial. It works by stimulating the respiratory cells to secrete an anti-viral protein. Ginger also inhibits mucous production and helps clear up congestion. GARLIC. Garlic destroys various viruses that cause respiratory infections and influenza. Read more Garlic- Nature’s Little Miracle. Incorporate garlic in as many dishes as you can. Guacamole, Tzatziki, Dandelion Pesto, garlic sauces (mojo rojo), Salsa etc are some of the ideas for creating raw, garlic-rich and delicious dishes. SHIITAKE MUSHROOMS have a strong anti-viral effect which is believed to be caused by the interferon compound found in the mushroom. Inteferons, created in vertebrates as a reaction to viruses, help to inhibit the replication of viruses and boost the immune system of the consumer. BLACK CUMIN (Nigella sativa) Seed Oil. Known also as ‘The Remedy For Everything But Death’. Because it has a spicy, nutty flavor, black cumin can be sprinkled whole or ground up on food, and the oil can also be used on salads and other dishes. CRANBERRIES. Often a popular part of holiday celebrations, are full of antioxidants and also have strong anti-viral properties. LEMON. Effective against multiple bacterial strains also anti-viral but not as strong. Because of its many other virtues e.g. strong purifier that rapidly remove toxins from the body, lemons do deserve to be listed here. Best to use fresh, whole organic lemons. Most of the supplements mentioned here can be found in most of the health stores in form of capsules (extracts) or tinctures. Typically, the tinctures (especially if you make them at home) have a very long shelf time. Most of these supplements you can find on the following links. Quality does matter; the links point to the high quality supplements and tinctures made from organically grown plants. ECHINACEA contains compounds with some amazing anti-viral, immune supporting and white cells boosting properties. LICORICE ROOT is a powerful anti-viral shown to kill SARS and other lethal viruses. BLACK ELDERBERRY (SAMBUCUS) is another strong and proven anti-viral typically available commercially as the syrup or sold as extract in capsules. CAT’S CLOW (Una de Gato) is used traditionally in Peruvian medicine for the treatment of a wide range of health problems. Cat’s Clow exhibited anti-viral properties when tested against two RNA viruses, vesicular stomatitis virus and rhinovirus 1B. SAGE. The Romans held this herb in highest regard and considered it to be the “savior of mankind”. Sage has also shown anti-viral activity against influenza virus. ASTRAGALUS has been shown to boost the immune system and inhibit certain viruses, such as the Cocksackie B. It enjoys a long history of preventing and treating colds and various other respiratory-related conditions. Astragalus, typically sold as a tincture should be taken preventatively. OLIVE TREE LEAVES. The leaves from olive tree contain elenoic acid that has been identified as a potent inhibitor of a wide range of viruses. To make the medicine, gather the leaves from the trees, add them to a large container of water and boil it into a concentrate. Drink or use topically. LOMATIUM DISSECTUM. A “perfect” anti-influenza herb because its anti-viral action is combined with a respiratory relief that is especially useful with secondary infections caused by strains of influenza. Best to buy as the tincture, if you don’t have an access to the fresh herb. GRAPEFRUIT SEED EXTRACT. Grapefruit seed extract is effective against more than 800 bacterial and viral strains, 100 strains of fungus, as well as a large number of single-cell and multi-celled parasites. YARROW. Yarrow has been known for ages and especially during the wars for its amazing ability of stopping the bleeding. Besides, yarrow helps in relieving influence symptoms and it is a strong anti-bacterial. If you think of Ebola caused internal bleedings, yarrow might maybe have a role? 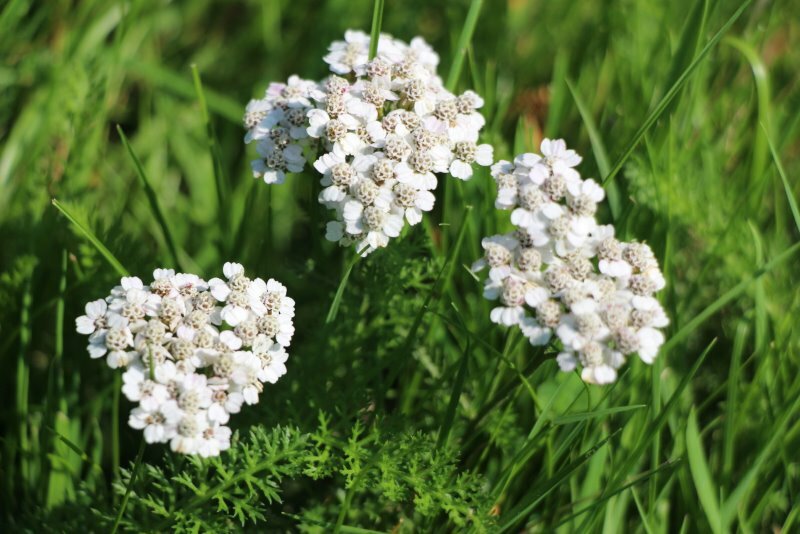 Yarrow most likely grows in the closest park – why not pick some and make your own tincture? Essential oils are highly concentrated plant constituents and some people call them “the soul of the plant”. Most essential oils have strong antibacterial, antifungal, and anti-viral properties which makes them the excellent “tool” to provide a dual-protective effect: by increasing the strength and efficiency of our immune response AND by limiting the ability of viruses to replicate. You can also add these essential oils in your tea (lemon balm, citron etc). Or in your bath. Or use it during an aromatherapy massage. Another way is through making gargles and mouthwashes for oral and sinus protection e.g. Comfrey root or Eucalyptus gargle and mouth wash are quite efficient. Beside topical application which is the preferred way (oils are rapidly absorbed in the bloodstream) another great way of using essential oils especially to protect your respiratory system and sinus lining is through using the steam to inhale vapors at safe levels (use a low potency). Put of couple of drops in boiling water and inhale the steam. Most of the essential oils mentioned below you can check out on the following links (pick the one that is closer to your geo-location). Quality does matter; the links point to the high quality, organic essential oils. Note that essential oils made from conventionally grown (non-organic) crops typically retain high levels of pesticides and may not exhibit the expected medicinal properties. Therefore, when possible, opt for the organic essential oils. LEMON BALM (Melissa officinalis) is one of the most powerful of the anti-viral essential oils, boosts the immune system and interferes with viral replication. OREGANO. Broad spectrum anti-viral with a long history of being used during plagues and pandemics. THYME. Broad spectrum anti-viral with a long history of being used during pandemics. CINNAMON (Ceylon Cinnamon). Extremely powerful. Broad spectrum anti-viral with a long history of being used during plagues and pandemics. CLOVE oil is one of the most powerful anti-viral, antibacterial, anti-tumorous, antiseptic oils. RAVENSARA is strong anti-viral oil which has been used to support healing from influenza, and is also an excellent nerve tonic. Ravensara oil is said to work effectively against acute cases of the flu, both through its anti-viral effects and its uplifting of mood and energy levels. RAVINTSARA (Cinnamomum camphora) has strong anti-infectious, antiseptic, anti-viral, antibacterial, antispasmodic, analgesic, carminative, expectorant and immune stimulant properties. HYSSOP decumbens is a very potent broad spectrum anti-viral essential oil, excellent for infection of lower respiratory tract. EUCALYPTUS radiata is a potent anti-viral essential oil that stimulates the immune system enhance the activity of the white blood cells. Excellent for colds, flu, infections of the respiratory system, including bronchial infections and pneumonia. FRANKINCENSE. Considered by some aroma-therapists to be the strongest immune-stimulant essential oil. PEPPERMINT is efficient against enveloped viruses (influenza (flu) viruses are enveloped viruses). ROSEMARY is another antiviral oils that has proven to be effective with ‘naked’ viruses. BLACK PEPPER. Antispasmodic, antibacterial, anti-viral. Black pepper essential oil is high in aldehydes which makes it a powerful anti-viral essential oil. CASSIA. Cassia is in the cinnamon family and has anti-infectious, antibacterial, anti-viral properties. BAY LAUREL. Found specifically to be active against the virus causing SARS. Other essential oils that have anti-viral properties and can prevent or provide the flu relief: Aspic Lavender, Tea Tree, Basil, Coriander, Geranium, Marjoram, Naiouli, Palmarosa, Petitgrain, Rose Otto, Sage, Spearmint, Lemon, Goldenseal. Drinking a lot of tea is another great strategy in creating layers of protection against the viruses. You can make your own anti-viral teas or liquid decoctions (raw plants prepared in form of a tea). Green tea for example contains a group of flavonoids which appear to inhibit viral infections and also act by blocking the viral viruses to replicate. Make your own “Super Anti-Flu Tea” using a combination (subset) of the proven anti-viral and anti-flu tea or tea ingredients. Note: Some of these have strong flavors so it may take a while to experiment and see what combination works well. Typically adding honey and lemon helps improving the taste. Here are some of the ideas Garlic Tea or Ginger Lemon Tea. You may consider applying a layer of extra protection on your face by using some powerful anti-viral essential oils like Lemon balm, Tea tree, Clove etc. You can put couple of drops in your facial cream or in a career oil (my preference is coconut oil) and apply on the face and especially around the nose and ears to create a layer of protection in order to stop the viruses from penetrating. Consult your health care practitioner before using any essential oils or supplements especially if you are pregnant, nursing or sick. Wishing you a healthy, cold-free and flu-free season!